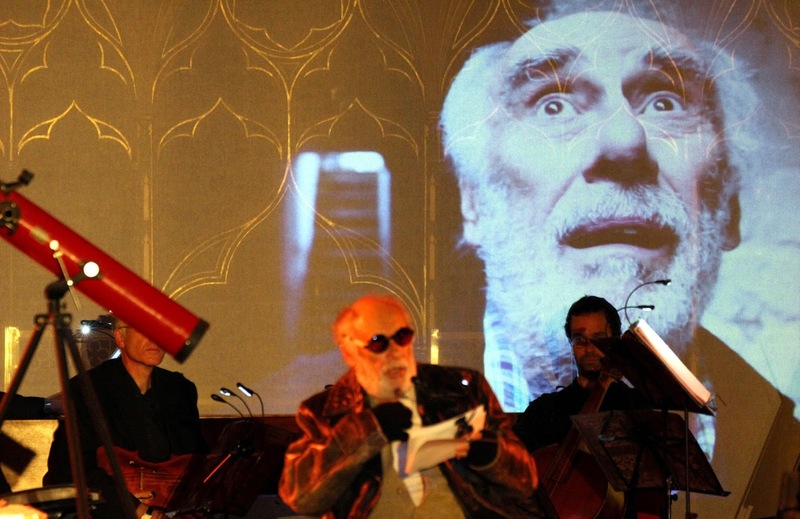 Having previously explored the life and music of Gesualdo and of Hildegard of Bingen, Clare Norburn and Brighton Early Music Festival (BREMF) turned their attention to Galileo for this year's festival. Whilst the Renaissance scientist might seem an unlikely figure to be the subject of one of Norburn's plays with music, in fact there are a number of intersections. 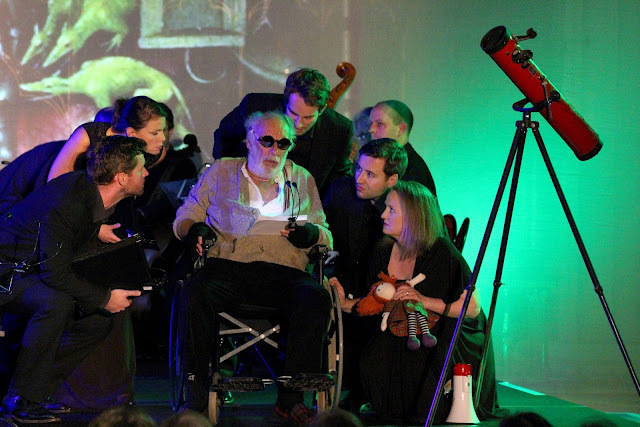 They presented Galileo - A music drama on the life and discoveries of Galileo Galilei at St Paul's Church, Brighton on 29 October 2016. Roger Watkins performed Norburn's text, whilst the Marian Consort (Katie Trethewey and Miriam Allan sopranos, Rory McCleery countertenor & director, Guy Cutting and Simon Wall tenors, Edward Grint bass), and the Monteverdi String Band (Oliver Webber violin/leader, Theresa Caudle violin, Wendi Kelly and David Brooker viola, Christopher Suckling bass violin, Peter McCarthy violone, David Miller lute, Alex McCartney lute, Steven Devine organ/harpsichord) performed music by Monteverdi, Vincenzo Galilei, Francesca Caccini, Francesco Canova da Milano, Joan Ambrosio Dalza, Cristofano Malvezzi, Giovanni Bardi, Giovanni Gabrieli, Cipriano de Rore, Emilio de'Cavalieri, Giovanni Antonio Terzi, Orlando di Lasso, Giuseppe Scarani, Michelangelo Galilei, Domenico Mazocchi, Giovanni Girolamo Kapsberger, and Alessandro Piccinini. The performance was directed by Stephen Tiller. Galileo Galilei was born into a family of musicians, his father was a lutenist and Galileo would play lute duets with his father. Throughout his Galileo's life, music intersects his activities. As a young man he assisted his father's experiments to prove that equal temperament was better than mean-tone tuning, and as his father was a member of the Florentine Camerata, whose experiments led to the development of monody and to opera, the music in Galileo's life was cutting edge. Galileo was present at, and almost certainly involved in, the creation of the Florentine Intermedi of 1589, a musico-dramatic presentation which was an important pre-cursor of opera. The play presented Galileo on the last day of his life, before his execution, reminiscing and remembering with music forming the backdrop to memory. Norburn's text presented important moments from Galileo's life, and of course the salient points in his struggle with the Papacy, but there was so much involved that there was scope for a far more substantial play with far less music. The problem, as compared her previous explorations of Gesualdo and of Hildegard, is that the music in Galileo's life was far less germane to his inner life than his science. As a scientist I wanted to hear far more about that side of Galileo, but there wasn't time to present it. But the music was certainly worth hearing, in fact I had the rather heretical thought that the programme would have made a fine concert, with some sort of extended explanation as to the various interlinkages between Galileo and the music. We were presented with the gamut of musical form, from instrumental sonatas to sacred motets and madrigals, to monody (a voice and instruments) and opera. This latter included an excerpt from Francesca Caccini's Liberazione di Ruggiero which BREMF performed at last year's festival, and which was premiered at the Florentine court when Galileo was employed there. 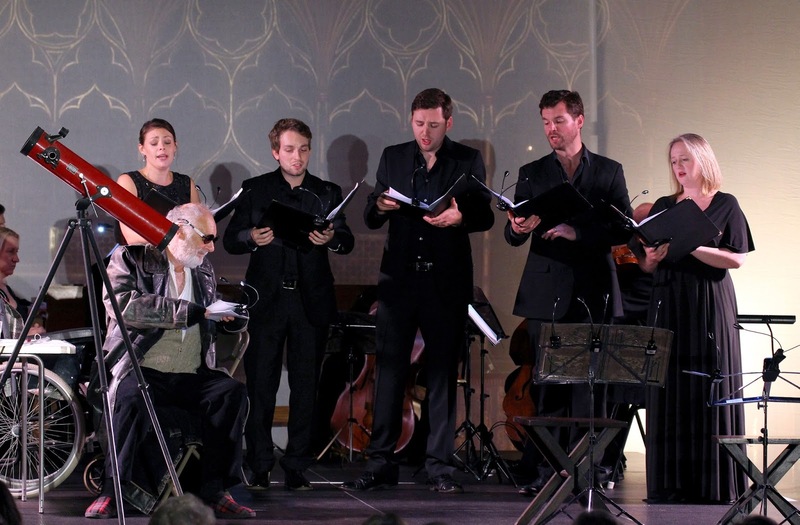 Threading their way through the programme were madrigals by Monteverdi, demonstrating the revolution in music which was happening, and using texts which touched on ideas which troubled Galileo. The links between Galileo and the music were many and fascinating, not just his father's lute duets which the two of them must have played, but music from the 1589 Intermedi. There was even music from La Catena d'Adone an opera by Domenico Mazzocchi, who was a composer favoured by Pope Urban VIII, Galileo's friend and patron who ultimately had him condemned. The musical performances were superb, the six singers of the Marian Consort coming together in a variety of configurations, including demonstrating some poised solo singing. And they also got involved in the stage action, and even helped with Galileo's experiments. 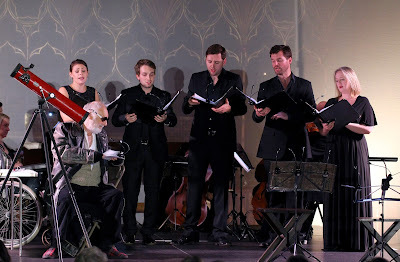 They were well supported by the players from the Monteverdi String Band, who provided vivid and engaging playing whether in accompanying the singers or in the instrumental items. Of particular note were the lute duets, and it was a shame that those used as preludes to each half were not listened to more closely by the audience. 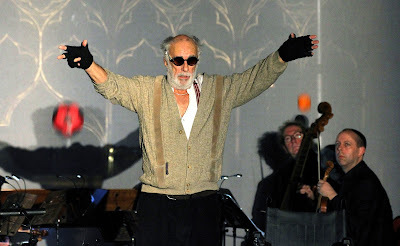 Roger Watkins gave us a rehearsed reading, but managed to create a real sense of Galileo as a person. Though his was a dramatic and vivid presentation, there were too many occasions when it was clear that he was reading. His delivery was at times stilted and it was not always possible to hear the words, which detracted somewhat from the piece's concept. I am not certain that the text and the music gelled to create a sense of a greater whole, in that way that the pieces about Gesualdo and Hildegard of Bingen did at previous festivals. Galileo felt much more of a work in progress. What it did do is open our eyes and ears to the remarkable musical backdrop to Galileo's life, and the way that music intertwined his scientific work. And it was the superb musical performances from the Monteverdi String Band, and from the Marian Consort which really lifted the performance. The piece is being performed again tonight (30 October 2016), and the whole of this years BREMF is devoted to works exploring Nature and Science.